– as well as customized products for flexible manufacturing cells. settings where portable mobile usage is now the norm. Plug outlet with surge suppressor. Top door monitor with tempered glass. Bottom door for computer and printer storage. Middle door for pull-out keypad access. Constructed from modular T-slotted Aluminum Profile frame. 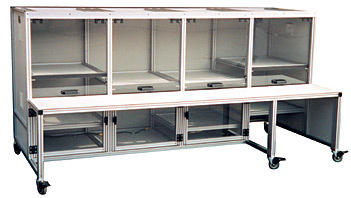 Computer workstation is designed to be portable for usage in various production areas. Storage areas for CPU, monitor, printer.